How late is too late for an abortion? In the end I am left to wonder if -- in spite of all the discomfort of cases like Sarah Catt’s -- we can afford not to be hard-line about a woman’s right to choose up right until the moment that she and her offspring are permanently separated. We are losing so much ground to pro-life concessions and compromises already. Maybe it’s time to stop backing down and making apologies; maybe it’s time to enforce the “personhood” of pregnant women first. 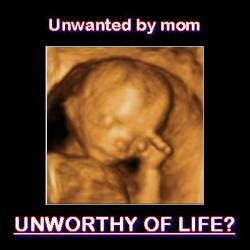 If "reproductive choice" comes at the expense of another human being's life, then so damned what? The only person who matters is ME.